BELIZE CITY, Tues. Apr. 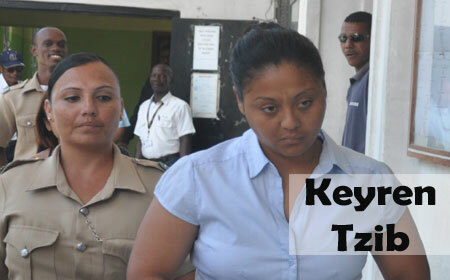 7, 2015–This afternoon, CIB police officers escorted Keyren Tzib, 24, a six-year veteran female seaman of the Belize Coast Guard, to the Magistrate’s Court, where she appeared before Chief Magistrate Ann Marie Smith, who arraigned her on three criminal charges in connection with a shooting incident on Easter Monday, April 6, onboard a Coast Guard vessel returning from San Pedro after completing a multi-agency operation. Tzib, who was represented at the arraignment by attorney Audrey Matura-Shepherd, was not required to enter a plea, because she was charged with attempted murder, an indictable offense which will be heard in the Supreme Court if the prosecution succeeds in making a prima facie case at the preliminary inquiry stage. In addition to the charge of attempted murder of Kurt Hyde, 37, Petty Officer First Class, who Tzib allegedly shot once with her Coast Guard-issued M4 Carbine rifle, police also charged Tzib with use of deadly means of harm and dangerous harm. Tzib was remanded to the Belize Central Prison until July 2. Initially, the Belize Coast Guard had indicated that they would have briefed the media on the incident, but that briefing did not occur. Police, however, covered the incident in their press release today. The report stated that one 5.56mm expended shell was recovered from the scene. The Coast Guard headquarters is located in an area formerly known as Belizean Beach. Hyde is a 9-year veteran of the Belize Coast Guard. There was no exchange of words between Hyde and Tzib, and according to the police press release, Tzib allegedly pointed her weapon and “shot Hyde once in the left side of the face,” said Superintendent Hilberto Romero, who briefed reporters on the incident today. “We have not established a clear motive at this time and we are continuing with the investigation,” he said. Tzib, according to a report circulating via the social network Facebook, had previously been involved in another incident in which she had allegedly become violent in her dealings with another Coast Guard colleague. That report has caught the attention of Tzib’s attorney, Matura-Shephered, who, when asked what her client had told her about the incident, responded: “I will not give the details of anything of what happened, but I am most disappointed that people have been casting aspersions and have been saying mean things. “There is a lot more into the case or maybe there is not, but it’s unfortunate that it seems that the case has been tried on Facebook by some people. I think it’s an indication of the little respect we have for our judicial system and also of the respect we show for women. I won’t even repeat some of the things that I understand have been posted, but I’ll just say that people should just take time and step back and reflect. It’s a serious offense which she’s being charged with and whatever allegations, anything that is being said, there are serious matters to be dealt with and the Coast Guard, especially, needs to answer a lot of the questions, since I understand that there are a lot of information that has been leaked through them. They have a lot to answer to,” said Matura-Shepherd.